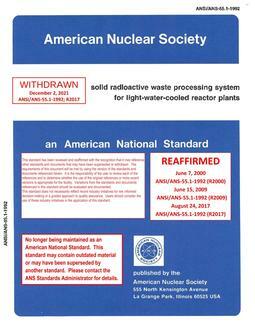 This standard establishes the nuclear safety criteria and functional design requirements of structures, systems, and components of stationary boiling water reactor (BWR) power plants. Operations, maintenance, and testing requirements are covered only to the extent that they affect design provisions. A methodology is given for classifying all equipment into one of three Safety Classes according to its importance to nuclear safety or into a Non-Nuclear Safety Class. Another methodology is given for identifying and categorizing into one of five Plant Conditions the normal operations and events for which the plant shall be designed. Acceptance criteria are given for each Plant Condition. Specific design requirements are given for each major system in a typical plant. 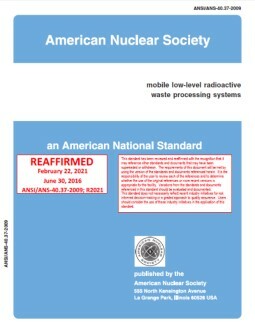 These requirements are related to other, more specific design standards and are intended to amplify the criteria given in the Code of Federal Regulations, Title 10, "Energy," Part 50, "Licensing of Production and Utilization Facilities," Appendix A, "General Design Criteria for Nuclear Power Plants."